I thought that this unlikely sounding device must be the oddest of the often strange attempts by the military to use bicycles. Unfortunately there were no accompanying pictures in the book. Luckily I had the internet close at hand and was quickly able to google up some more information. 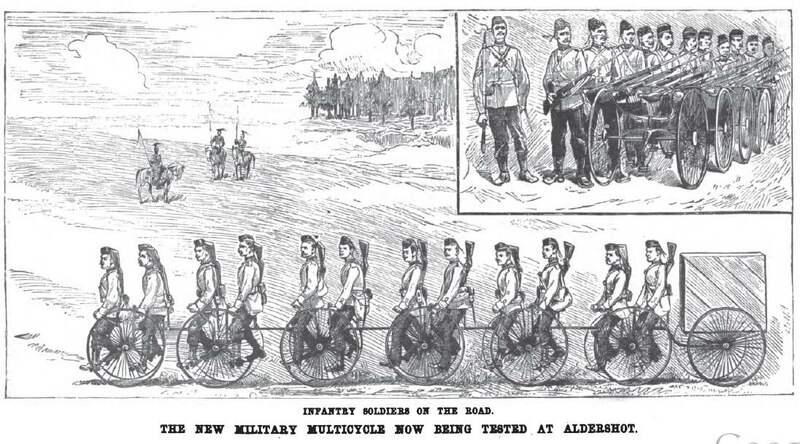 Of late years attempts have been made to apply velocipedes to military purposes, the results of which have been so favourable that one might well expect to see companies of troops mounted on these vehicles. 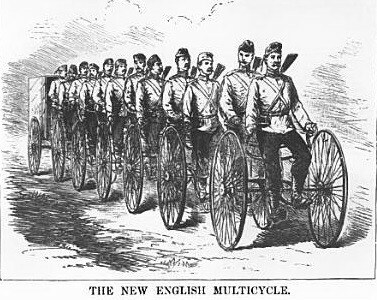 But heretofore only velocipedes have been tried, so that the new English invention the military multicycle by the London firm Singer & Co. is a decided advance in the transportation of infantry from one place to another. It will carry twelve men who, in case of necessity, can draw a light baggage car or ammunition wagon. The operators are seated in line, one behind the other, the vehicle can be easily steered, and offers less surface to unfavourable winds than if two or four men rode abreast. The multicycle can be propelled remarkably fast, making ten English miles an hour, or with practiced hands fifteen to sixteen miles an hour. And it suffers less than other velocipedes from bad roads, and can easily pass over railroad tracks.The entire control and guidance of the machine lies in the hands of the first man, and at a recent trial in London he had no difficulty in carrying out his part of the work, even in the most crowded streets.The multicycle required less room than a hansom for turning, and made its way without accident among numberless vehicles of all kinds.Military evolutions can easily be carried out on the machine, and, in the case of attack, it can serve as a protection for the men who can fire from behind it. The war department are trying to make the multicycle practical for war purposes. I also found a description of the machine in The Sydney Mail of July 1887. The text of that article is almost identical, but has some further tidbits of information. It describes the multicycle as being Singer an Co.’s, “latest adaption of their Victoria or Four-in-Hand Quadricyle” and describes the tires as being “wired on the Otto principal, so that they cannot be greatly damaged by cuts from sharp stones”. The machine was to be severely tested at Aldershot by the authority of the war office. I can only imagine that this contraption did not fare well during the severe testing. Although there is probably no existing example of the multicycle, it’s fun to imagine that it may someday turn up in some cobwebbed warehouse or barn. If not, maybe some crazy re-creationist with too much time on their hands will reproduce it. I’d love to see one in action! The Last Ride of Summer. 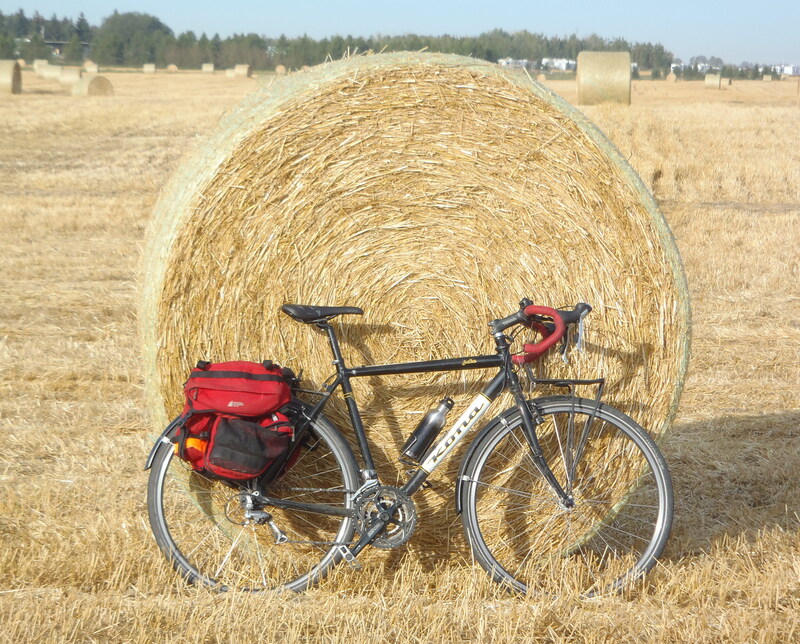 This past Saturday morning, I took a nice 60 km ride up the rural roads north of the city. On previous rides, heading up range road 240, I had noted some clusters of houses off to the West between RR240 and highway 28. There were some gravel roads leading in that way that I had always skipped when I was riding my touring bike, but this time I came prepared on my Kona Jake “CX” bike. Can you guess what I found when I boldly forged my way into those unexplored rough roads? Shockingly, I found houses! Also, further in, paved roads. There are several little developments in there, apparently inhabited by friendly people who wave cheerfully at early morning cyclists. In fact, in a bizarre turn of events I received more waves from drivers than I did from the various groups of cyclists I encountered later in the ride. Although the prosaic nature of my discoveries was a little deflating, it was good to explore a few new corners of the countryside on the beautiful last full day of summer. These gravel roads were somewhat more passable than they were when I first tried riding them this spring. 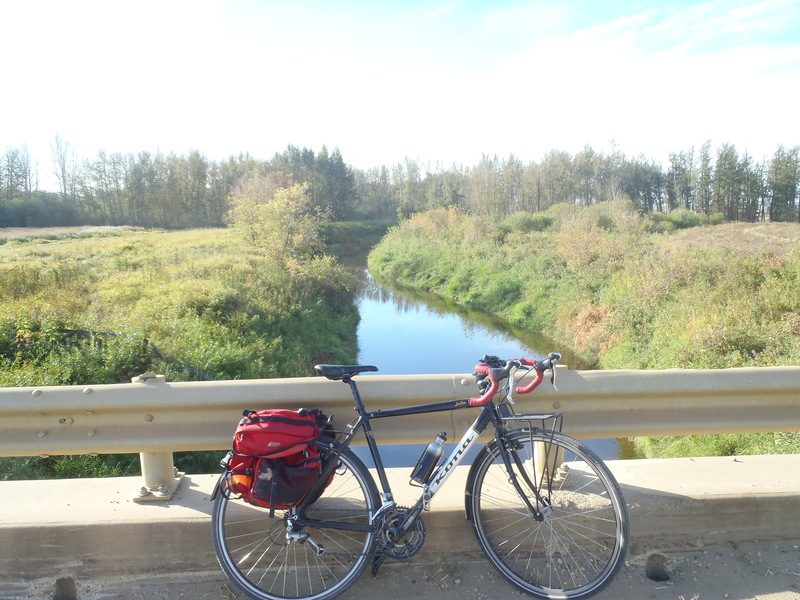 As near as I can tell from the map, this must be the Sturgeon River. Back home, we’d call this a brook. 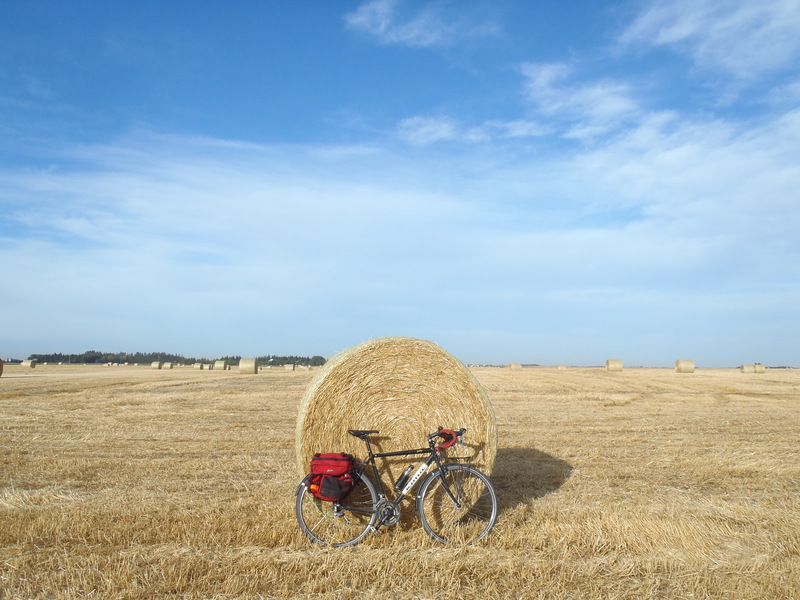 I took a lot of pictures at this field of bales. 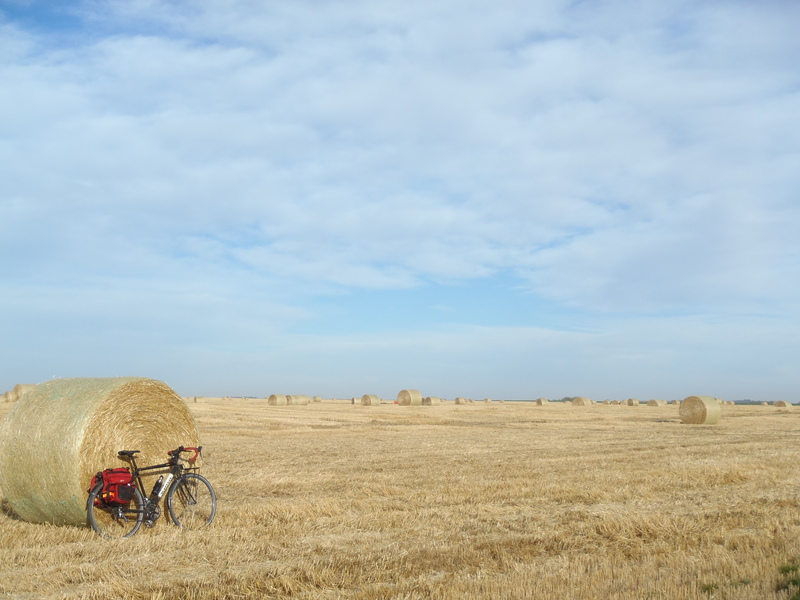 It’s a very geometric sort of vista with the straight line of the horizon and the cylindrical bales of hay. It felt a little like being in some sort of sculptural, land art installation. Am I a city slicker, or what? I found this sign in one of the loops of houses. 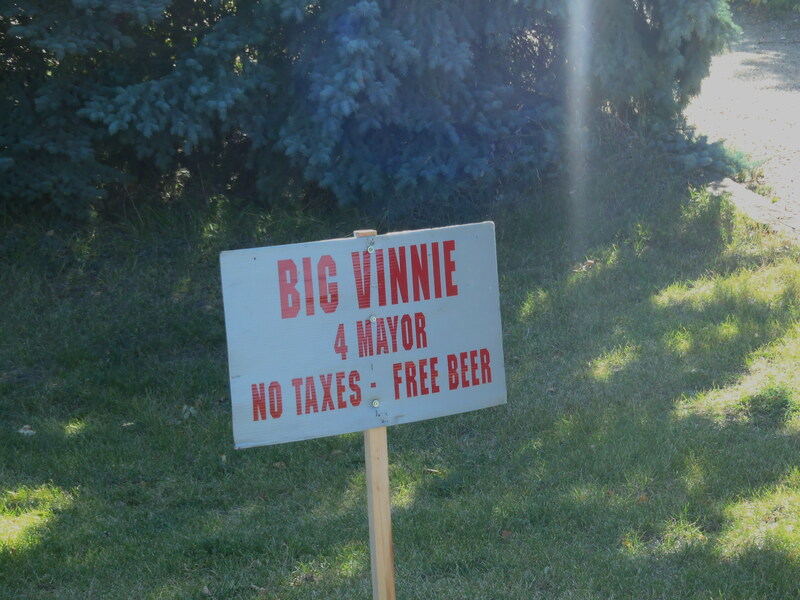 As I didn’t see any other election signs, I assume Big Vinnie has a lock on the election in this area. 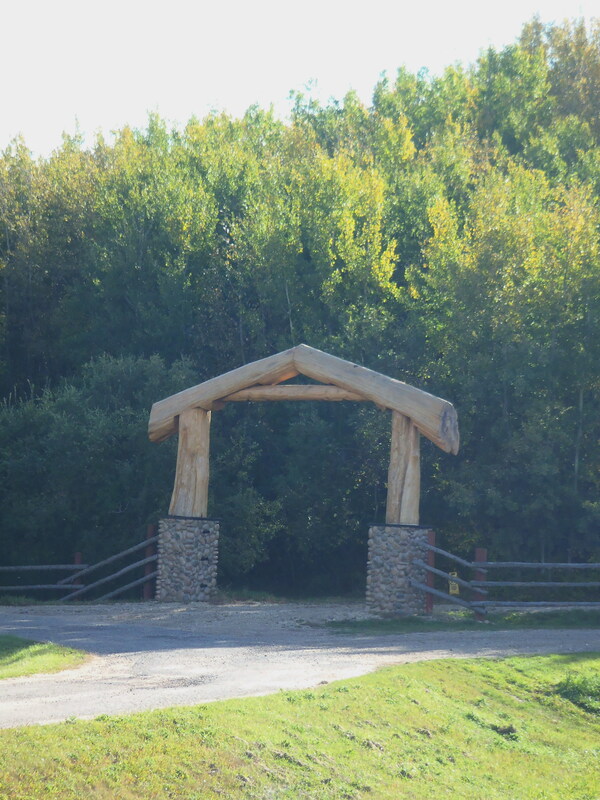 I don’t know what’s behind this gateway, but I’ll bet it’s ostentatious. I’ve been having pretty good luck finding washed out infrastructure lately. There really was quite a bit of rain this summer. This turned out to be a dead end. Check your maps, kids! 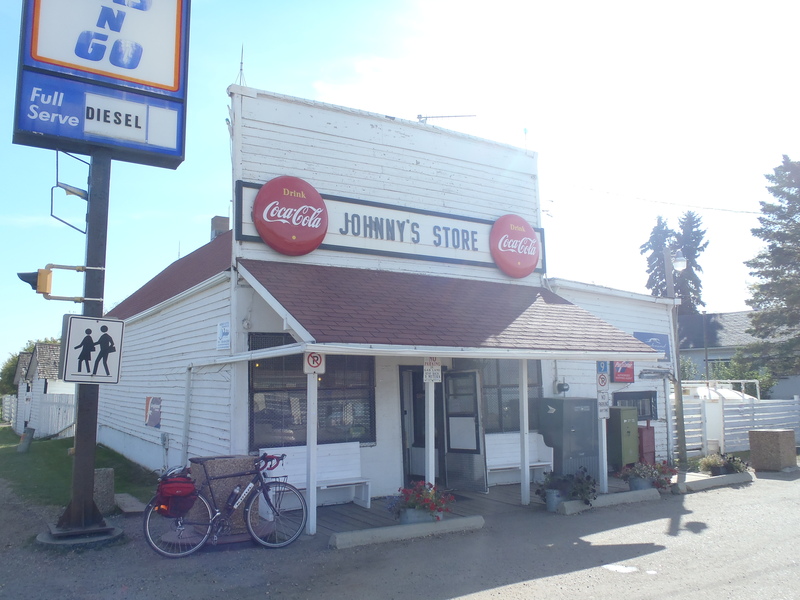 On the way back into the city I stopped at this great little prairie store in Namao. I sat at the bench on the porch and ate the snack I bought inside: locally made beef jerky, ice cream and Dr. Pepper. I didn’t photographically document the lunch because I was worried about making this blog’s readers queasy. 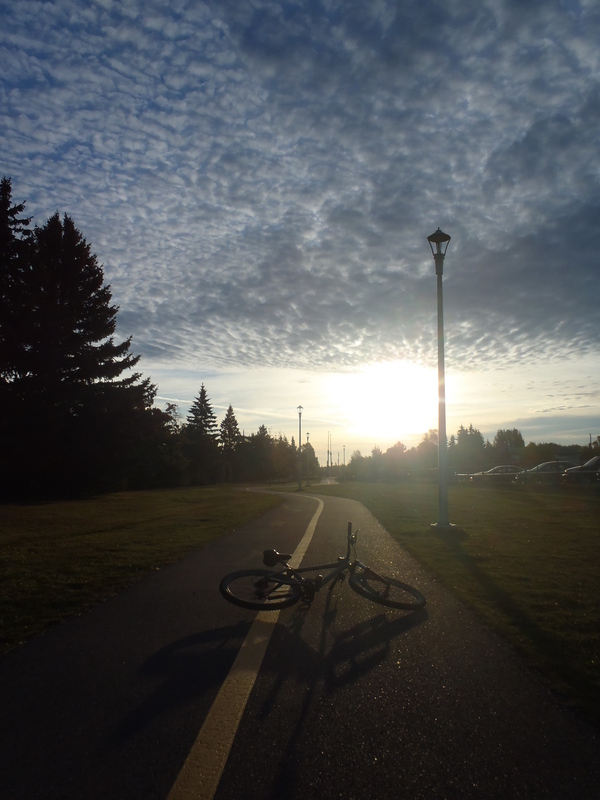 I hope this to be the first of a barrage of posts written over the next few days recapping this summer’s cycling. I have a new computer (with a properly functioning keyboard!) that should make blogging less of a chore. 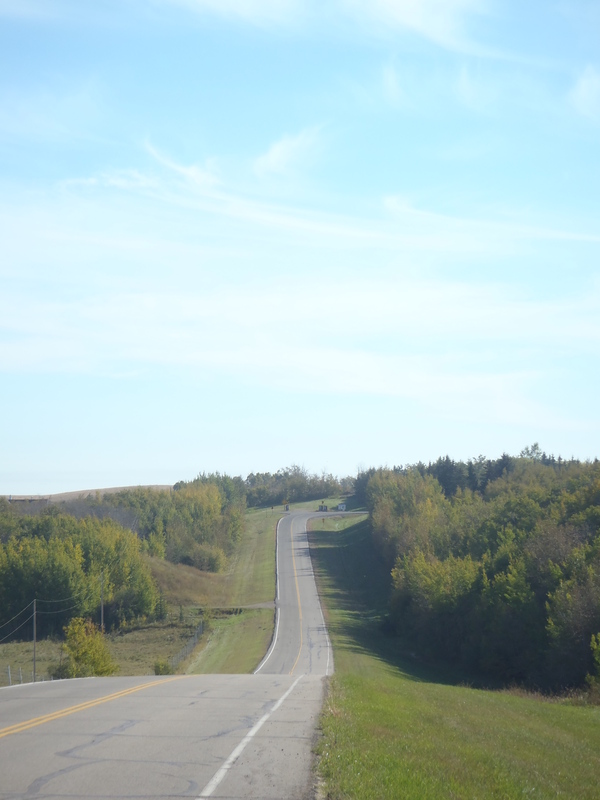 The first Edmonton reader who can correctly identify the location of this photo will win 1000 TuckamoreDew points that may be redeemed for pathetically small prizes. 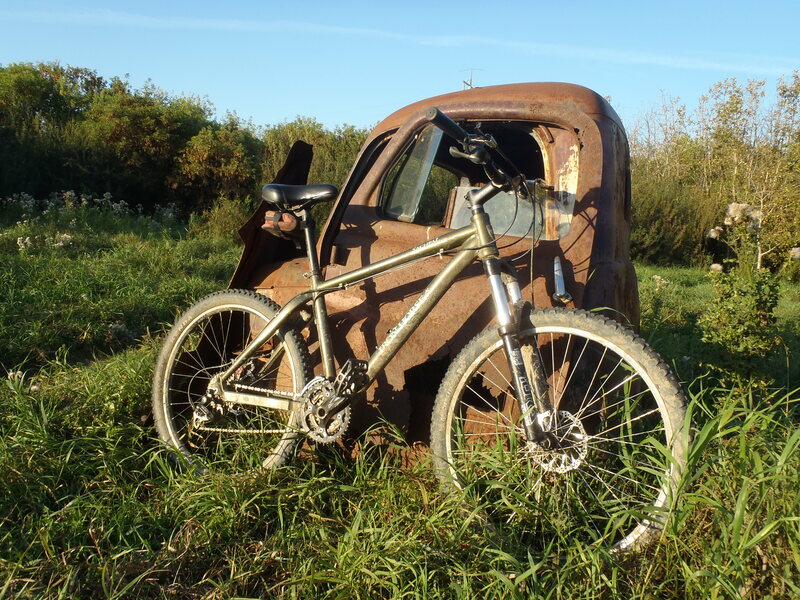 This past spring I was all fired up to ride the river valley trails on the mountain bike I built over the winter. The season started well, with a couple of good rides and the discovery off lots of nifty singletrack hiding off to the side of main trails I’ve been travelling for years. I’m pretty much completely lacking technical skills but I was having lots of fun, just the same. I vowed to ride the mountain bike at least once per week. 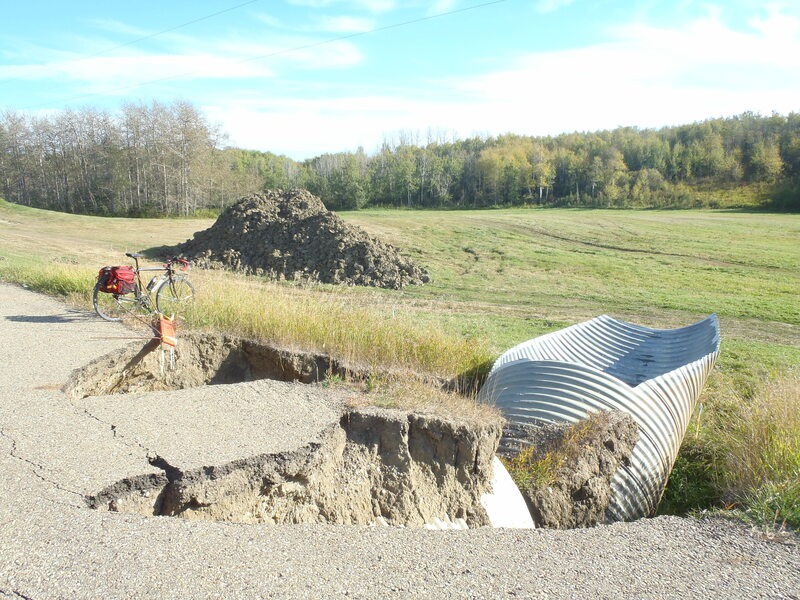 The main problem is that it was a very wet summer by Edmonton standards. For what seemed like months there were few periods where the weather was dry for several days in a row. The trails were mud pits and like a conscientious rider, I avoided riding them under those conditions to avoid chewing the heck out of the paths. The river was running high at one point and flooded some of the lower sections of trail. On the occasions that the trails might have dried out a bit, I was unable to get out for any rides. All in all it was pretty disappointing. ‘Course it could have been worse: I could have been laid up with a broken ankle. At least I got fair amount of road riding in. Finally, as the summer neared its end, we were treated to an extended stretch of warm, dry weather. I’ve snatched the oppourtunity to get in one good weekend ride and a weekday commute by MTB. Here’s a quick photographic overview. These trails are a blast to ride. The local mountain bike enthusiasts have been hard at work building and maintaining trails, complete with bridges where necessary. Awesome work, folks! Frankly, parts of these trails were beyond my riding ability and there was an amount of cowardly walking my bike down steep sections. Luckily, I encountered no other riders and was spared any embarrassment. I heartily approve of the sentiments expressed on the Pipedream sign shown below. There was a fine example of crumbling infrastructure. Below you can see a few examples of the excellent features the trail builders have created. Thanks again! The washed out bridge was just fine when I was through there this spring; that little creek must have been running pretty strong during all the rains. 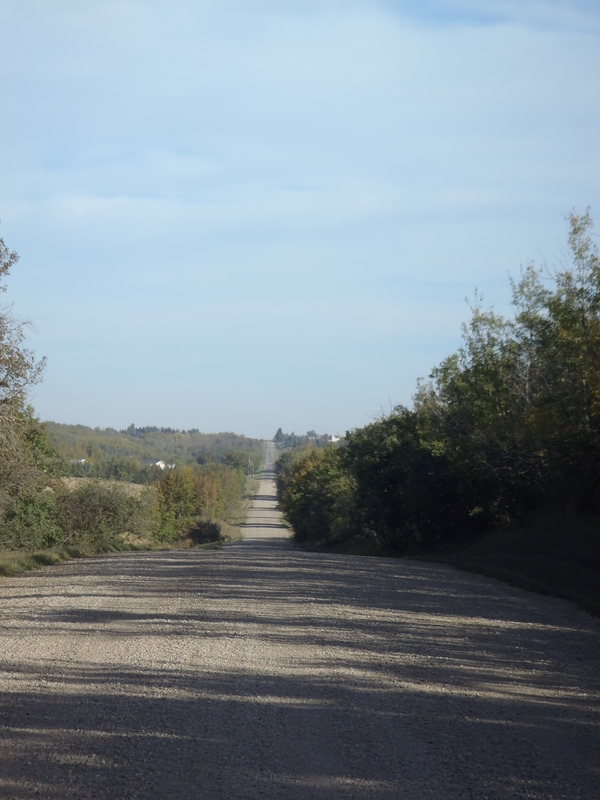 Eventually, I found my way to Forest heights for a view of my beloved river valley, the single best feature of life in Edmonton. Click to enlarge. No, I really mean it: it looks much better that way. I had a quick break for a drink of tea and then rode the trails below the heights, and then on towards home. An excellent morning of autumn trail riding. Wednesday morning saw the arrival of a cold snap, with a daybreak temperature of only 5°C. Meaning I had to forgo my normal commuting attire of sandals, shorts and t-shirt for warmer clothes. Meaning I was a little grumpy. However, once I was in the valley, sucking in the cool air and careening down the leaf-strewn single track I was reconciled to the changing of seasons. The just risen sun illuminated the looming mackerel sky. Beatific. I was running late for work and had to abandon the single track for paved trails part way through Mill Creek. That’s OK though, because on the way home at the end of the day I took my time and continued my trail explorations, discovering a few new turns that I will be revisiting. I rode the low trail down by the river that had been flooded earlier in the summer. Signs of the flooding were apparent in the deeply cracked earth. 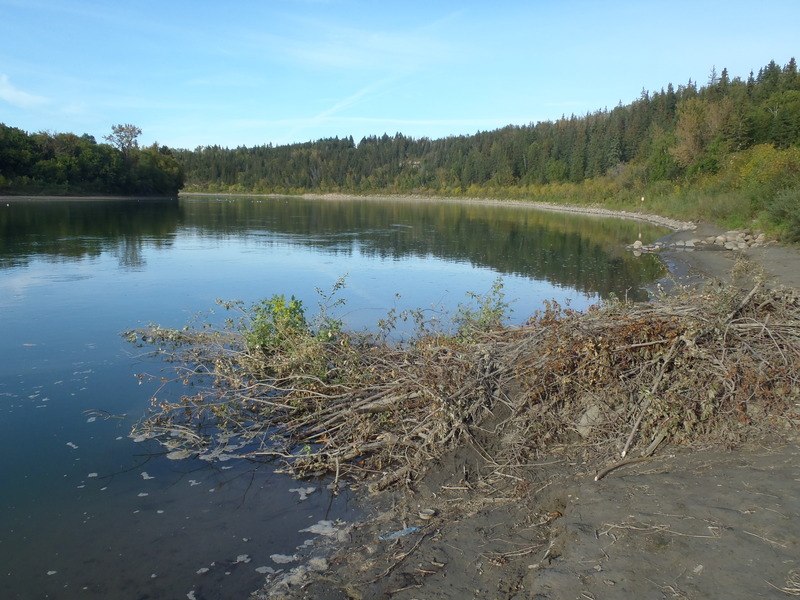 While I was riding the riverside trail I also saw a lot of signs of beaver activity, and was unsurprised to soon spot a beaver lodge. In my younger days I probably would climbed up on it and tried to rouse the sleeping animals inside. Years older, and now much more appreciative of sleeping myself, I left them in peace. From here I made my way home, pleasantly tired but with renewed resolve to squeeze in as much riding as possible before the inexorable arrival of winter. Which is much closer than any of us want to think about.